Bad Axe Throwing’s Winter 2017 League Season was full of many victories. Axe throwing enthusiast alike across all locations, throw after throw fueled the energy for an awesome outcome. We are extremely grateful to all members who showed up and made this season not only possible but incredible. Thank you. Our Bad Axe Throwing Leagues have had great success with sharing our love for axe throwing and taking it to a competitive level. For 7 skill-strengthening weeks our members challenged themselves on becoming their best. Every week players received 40 throws each, 10 throws per player at a time and 4 rounds in total to tally up an individual score. Although players are technically adding to their own score, there are two players throwing at a time which definitely feeds the hunger to win. And that doesn’t got to waste because in the 8th week Championships begin. Ultimately, a Lumberjack or Lumberjill is titled: Bad Axe Champ. If there ever was a trophy or in this case an axe to win, its definitely this one. 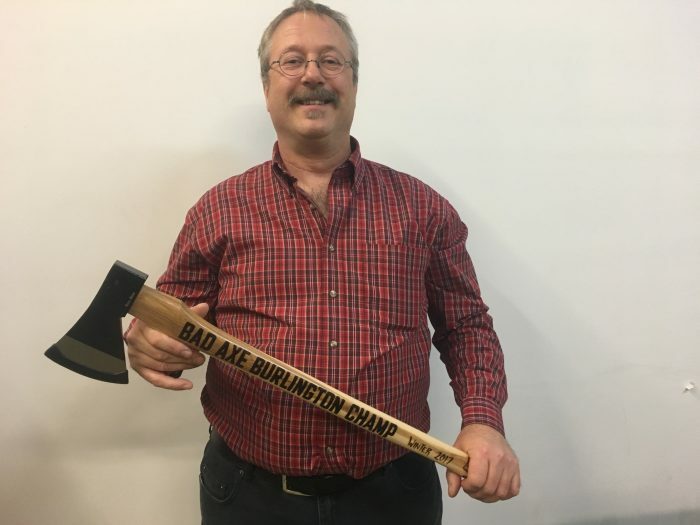 The winner of our Burlington location (Bad Axe Throwing’s first location – where it all began) proudly stands claiming his title as Champ. Another great aspect to Bad Axe Throwing Leagues is during week 4, our players are welcomed to invite family and friends for free to just have fun. No scores are being kept, no pressure is on, it’s simply a night to just relax and enjoy. Our Chicago location was one of our biggest and busiest leagues yet. With so many axe throwing fans we had to reserve both Monday and Tuesday for leagues nights; a fantastic turn up. The nights started at 6:30 and finished at 9:30 – 3 insane hours of laughter, trash talking and confidence boosting. And finally Championships rolled in, semi-finalist Chad Philips (winner from Monday night) and semi-finalist John Snider (winner from Tuesday night) went axe to axe battling for who would come out victorious. Below is a video of the our Bad Axe Chicago Champ, John Snider, who we are sure will be defending his title next season. A shout out goes to all the coaches who made League nights possible. You are all awesome, thank you. Coaches were there helping everyone get comfy with one on one training, keeping scores and the energy pumped. Again, a BIG thank you from Bad Axe Throwing to everyone, you all rock. We look forward to seeing you next season.